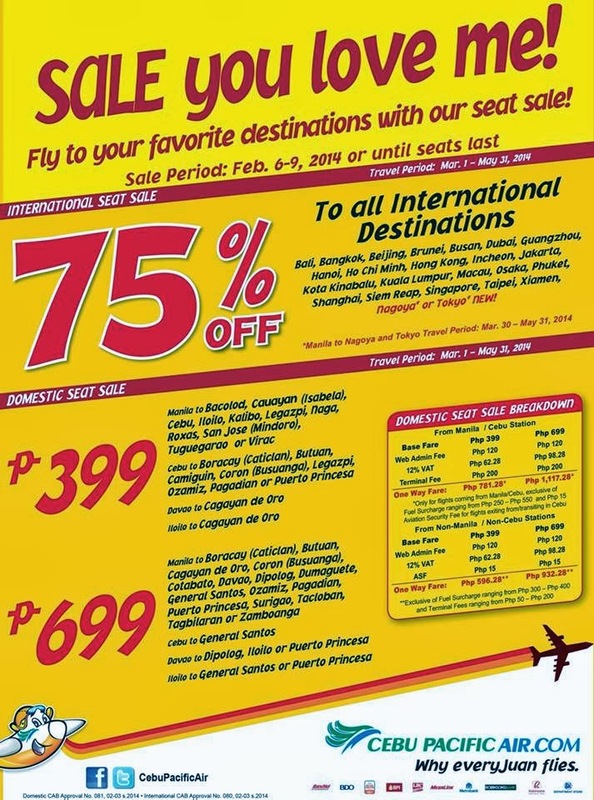 Piso Fare: This is the latest Seat SALE offering from Cebu Pacific Airlines! You may grab this opportunity to book the cheapest tickets you can. #CEBseatsale! Hurry book your tickets while you can! Kuala Lumpur, Macau, Osaka, Phuket, Shanghai, Siem Reap, Singapore, Taipei, Xiamen, Nagoya* or Tokyo* NEW! **Only for flights coming from Manila/Cebu, exclusive of Fuel Surcharge ranging from Php 250 – Php 550 and Php 15 Aviation Security Fee for flights exiting from/transiting in Cebu. **Only for flights coming from Manila/Cebu, exclusive of Fuel Surcharge ranging from Php 200 - Php 450 and Php 15 Aviation Security Fee for flights exiting from/transiting in Cebu. 75% OFF discount is applicable on INTERNATIONALfares only inclusive of 7 kg hand-carry baggage allowance. The following fees shall apply after discount: Php 120 Web Admin Fee, Fuel Surcharge ranging from Php 440 – Php 4,840, Terminal Fees ranging from Php 450 – Php 550, Country Specific Taxes ranging from Php 403 – Php 1,250 and check-in baggage. Quoted DOMESTIC way fares are inclusive of Base Fare, Php 120 Web Admin Fee, 12% VAT, Php 200 Terminal Fee for flights transiting in or exiting from Manila/Cebu Station and 7 kg hand-carry baggage allowance, but exclusive of Fuel Surcharge ranging from Php 200 – Php 500, Php 15 Aviation Security Fee for flights coming from Cebu and check–in baggage. Terminal Fees ranging from Php 50 – Php 200 for flights originating from non-Manila/non-Cebu Stations must be paid at the airport. AVAILABLE NUMBER OF SEATS ON SALE PER ROUTE and v.v. DOMESTIC: Manila to : Bacolod: 45,751; Busuanga: 239; Butuan: 13,841; Cagayan de Oro: 42,715; Caticlan: 7,786; Cauayan: 1,448; Cebu: 75,191; Cotabato: 4,791; Davao: 52,168; Dipolog: 3,153; Dumaguete: 9,409; General Santos: 15,510; Iloilo: 39,133; Kalibo: 12,381; Legazpi: 13,635; Naga: 1,002; Ozamiz: 3,920; Pagadian: 4,627; Puerto Princesa: 4,563; Roxas: 6,085; San Jose: 4,742; Surigao: 33; Tacloban: 12,658; Tagbilaran: 865; Tuguegarao: 5,808; Virac: 698; Zamboanga: 18,545. Cebu to: Busuanga: 28; Butuan: 7,596; Camiguin: 2,012; Caticlan: 4,166; Legazpi: 773; Ozamiz: 1,800; Pagadian: 2,153; Puerto Princesa: 3,399; General Santos: 4,932. Davao to : Cagayan de Oro: 2,629; Dipolog: 1,130; Iloilo: 3,423; Puerto Princesa: 75. Iloilo to : Cagayan de Oro: 1,960; General Santos: 2,255; Puerto Princesa: 1,136 and v.v. INTERNATIONAL: Manila to : Bali: 1,579; Bangkok: 3,565; Beijing: 4,056; Brunei: 1,396; Busan: 1,750; Dubai: 2,800; Guangzhou: 6,083; Hanoi: 2,043; Ho Chi Minh: 6,218; Hong Kong: 14,766; Incheon: 9,138; Jakarta: 3,468; Kota Kinabalu: 3,300; Kuala Lumpur: 8,150; Macau: 1,272; Nagoya: 2,116; Osaka: 2,625; Phuket: 1,955; Shanghai: 9,815; Siem Reap: 1,233; Singapore: 8,145; Taipei: 5,228; Tokyo: 1,395; Xiamen: 3,123. Cebu to : Bangkok: 77; Busan: 3,697; Hong Kong: 5,311; Incheon: 7,591; Singapore: 3,491. Clark to : Hong Kong: 1,680; Macau: 1,173; Singapore: 2,359. Iloilo to : Hong Kong: 2,698; Singapore: 448 and v.v. Promo fares have limited availability and are non-refundable but rebookable subject to the following rebooking fees: Php 1,200 for Domestic destinations, Php 2,000 for short-haul International destinations and Php 2,500 for Dubai plus fare difference. Please note that booking fee rates range from Php 120 – Php 200 depending on purchase channel. For your convenience, flight changes, availing of prepaid baggage allowance for check-in baggage and web check-in service can be done up to 4-hours before scheduled flight. magkano po kaya ung pamasahe ng isang tao kng april 11 to april 30?